Apple's stock closed just short of US$592 on Monday, but continued to climb closer to the $600 mark in after hours trading. The iPhone and iPad maker's stock has continued to climb ever since it announced a 7-to-1 stock split during its second fiscal earnings report on April 23. Apple's split-adjusted trading starting on June 9. The split means for every single share investors hold as of June 2 they will get six additional shares. The value of the original will be split across the new shares so the individual cost per share will be lower, but the overall value will be the same. The company reported $45.6 billion in earnings, announced an 8 percent increase in shareholder dividends, and said that $66 billion has been paid out to investors. 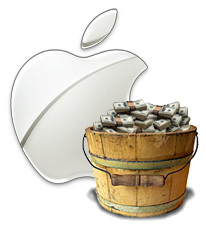 Apple closed on Monday at $591.97 and is trading in the Tuesday morning pre-market at $594.06, down 0.03 (0.01%).